I don't even know why I am here, writing this for the world to see. But I don't feel like I can tell anyone that I know, so here I am. I am a mother of 2, almost 3, and I have an anger problem. I yell all the time, I'm short fused, I'm a perfectionist, I'm a control freak, I get frustrated easily, I'm impossible. I hate myself for the kind of mother I am. I want so badly to be a good mom, to raise my children with good self esteem and the ability to deal with life in a healthy way. But all I am showing them is how to be unhealthy. I have never intentionally hurt my children. But there have been a few times that I have been too rough with them, grabbing them too hard, or putting them into their bed too rough. I don't want to be like that. I don't want to hurt my kids. I don't want my kids to be scared of me. I am afraid I have ruined my oldest son already. I'm always bickering at him, or criticizing him. I don't mean to. The words just jump out of my mouth before I have time to think. And then it is too late. I should say that I do also try to make up for my bad behaviour all the time. I do say sorry when I'm wrong. I do feel guilty about the way I act. But that doesn't excuse anything. I want to change, but I don't know where to begin. I am too scared to ask for help, because I don't want anyone to know who I really am inside. I don't want to be an angry mom anymore. I want to be the mom that my kids want to be around. I want to be able to have fun with them. I just feel lost here. I feel alone, and I don't know what to do anymore. Thanks for listening. Thank you for writing your story on this site. You are a good person, which is why you want to change your situation. You are not alone. You will find that other mothers have similar problems, and they have received help here. You can read some of those stories here. 1) Write from your anger on a daily basis. Get all of those thoughts and feelings out on paper. This is for no one's eyes but yours. You can destroy it after you've written it. You just need to give your anger a "place to be" so that it does not take over. 2) Write about all of the times you've been hurt, abandoned, neglected and abused in your past. This is where your anger comes from. Simply writing about these memories will help. 3) After writing about your anger, write about what you're grateful for from your past, what you appreciate about your present, and what you're optimistic about in your future. This positive journaling will activate the good person you truly are. Keep doing this positive journaling every day, no matter what, and you will get great results. Whatever you do, do not give up on yourself. Ever. You can do whatever you set your mind to. Believe in yourself. You can be the kind of mother you want to be. Feel free to write for more support on this site. I am pregnant expecting my first child and am so worried about being an angry Mom. My parents were strict and I got spanked through my childhood. I do not blame them because I understand it may have been necessary, yet I have anger from how rough they were with me at times. I want to learn from that with my own children and be strict enough to bring them up correctly but lovingly. I find myself being rough (even during play) when another persons child doesn't listen to me. I get frustrated and forceful which looks terrible. At the time is feels like it might work but afterwards I feel so disgusting and guilty! Now that my own child is coming I feel I need to change my attitude about discipline and sort out my frustration issues, but I'm running low on time before the baby comes and feel like I'm not ready. Its such a scary feeling. My husband is so supportive and reassures me that I am a good person and deep inside I love and care for all these children so much, but clearly can't show it when I become frustrated. I can't be gentle and it makes me sad. Hello - I'm so glad you added your comment here. Your true nature is to be a good person, and a good mom...that's why you're looking for ways to protect your child from your anger. Please read this page about understanding and healing for good women like yourself, who want to be good mothers to their children. You an heal. You can be the good mother you want to be. Use the resources on that page linked above, and you'll succeed. I am here because I so desperately want to be a great mom. This post is really old, so I'm not sure anyone reads this anymore. I have a 3 year old and the other night I lost my temper and my husband said, "What the hell was that?" I was so mortified by my own awfulness that I thought of running away so my son doesn't grow up with me. I thought he might leave me right there on the spot. This came after a fantastic day we shared. I know I need help, but I didn't know where to turn. I have no one to talk to. Since my son was born I find myself losing it with him but in public everyone says how well behaved and how blessed I am. I feel like a monster pretending to be someone I'm not. Maybe I should run away so I don't ruin my husband and son. After another night of screaming, I know I can no longer do this by myself. The screaming came from me. Despite the pictures you may see of me and my kids doing fun crafts, games, and trips to the beach and zoo with everyone smiling and looking happy, I feel like I am a bad mom. A monster sometimes. Before I had my 1st child I said we would never spank in my house. But boy has that changed. And I know they say you shouldn't spank out of anger, but I can't seem to control myself sometimes. I am so tired of feeling this way. Tired of feeling like I have to apologize to my kids for my outbursts (which I have done by the way). So I typed in "angry mom needs help" and found this letter that looks like I could have written it myself. While I am glad to know I am not alone, it saddens me. Saddens me that society and our own mothers did not prepare us for this. That perhaps not all of us were meant to be mothers. I love my children, make no mistake about that. But sometimes I wonder if God or whomever made a mistake in giving me children. How can I protect them from the world and teach them when I can't even act appropriately myself? When I still feel like I have no clue what I am doing? Thanks for reaching out here, and telling your story. Please know that it doesn't have to be like this, and your situation is not hopeless. You are clearly a good person, and that's why your anger toward your children bothers you so much. Please go to this page for angry mothers, and you will find the help you need. In our FAQ's, you will also find some help -- go to the FAQ link on the left column, and go to question #4. You can do this...you can be the good mother you want to be. Believe in yourself. One of Dr DeFoore's CDs talks about 'what if your loved one (in your case your children) were suddenly taken from you. It happens. Suddenly they're gone. Forever. Are the little irritating things that happen of importance at a time like that? No. You would do anything just to have them back. Many of the stories on here are from adult children who have post traumatic stress disorder gifted to them by their parents. I'm one of them. Some people who go through such things don't make it. If one of your kids decided to take that road, wouldn't you go back, to now, and get help for yourself? A really bad mother would never write for help like you did on this blog site. I feel so confident that you'll heal and be the mother you want to be. The same thing happened to me. 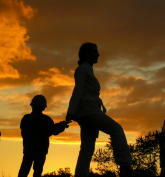 When my children were little I found myself criticizing them and emotionally abusing them like my mother did to me. I knew that it was wrong, but I felt out of control and didn't know how to change. At some point I told myself that I just couldn't go on being abusive to my children. I started on a quest to find help and become a better mother. I went out and bought books and recordings about parenting. Bill DeFoore's book about anger is excellent because it has anger releasing methods in it that really work. It's so much better to vent anger out on a pillow than on your own children. Also, if you buy the anger book, you can get a download of his affirmations, "Affirmations for Well Being" for free. I feel good recommending his book, because it helped me so much. I also put my own affirmations for parenting in my story "Raising my Children During Recovery". When I first started punching pillows and doing the anger releasing exercises, I was mortified about how much rage was in me. I even scared myself. I kept at it though, and one day, I just noticed that I felt so much calmer. I was better to my husband and my children. Then I began to realize something. Why wouldn't I be angry after how I was raised? Of course I had rage in me. Wasn't it normal to have those emotions? I'm just human. Getting my repressed emotions out has been the best thing I've done in my life. Healing my past and learning to be a better mother is the most gratifying accomplishment I've ever made. Nothing I do from this point on will compare to it. I've known some parents who were abusive and did not admit it. To them, they were being OK parents. You're not like that. I hope you write some more on this blog site. Join in and write your own page! It's easy to do. How? Simply click here to return to Child Anger.